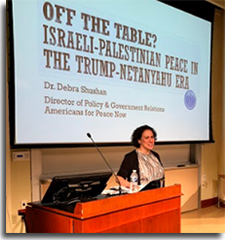 Dr. Debra Shushan, APN Policy and Government Relations Director, was recently in the Philadelphia area where she was the featured speaker at a J Street Philadelphia / J Street U event at Haverford College and guest at parlor parties. In her September 30 talk at Haverford entitled "Off the Table: Israeli-Palestinian Peace in the Trump-Netanyahu Era," she surveyed recent developments that threaten prospects for peace - from the rise of illiberal democracy in the US and Israel, to President Trump's efforts to take key issues off the negotiating table - as well as the work that APN and Shalom Achshav in Israel are doing to push back against this tide. A J Street U leader called the talk "phenomenal" and welcomed further collaboration with APN. Educational advocacy is an important part of APN's work. 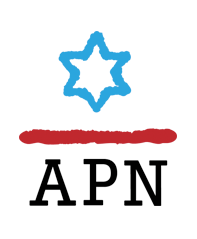 If you are interested in inviting someone from APN's Speakers Bureau to your university, synagogue, church, parlor event, or other gathering, please contact apndc@peacenow.org.